Celebration of the Arts presents: Cadence. The stage lights fall, the crowd goes quiet, and four harmonious voices rise up and fill the air. The melodies unfurl into something both familiar and fresh. What comes next may be a classic song by Joni Mitchell or Louis Prima. It may be an old bebop standard or cheeky arrangement of a 1980s hit. But these are arrangements like you’ve never heard them before—containing all the richness of a full band, but performed using just four voices. 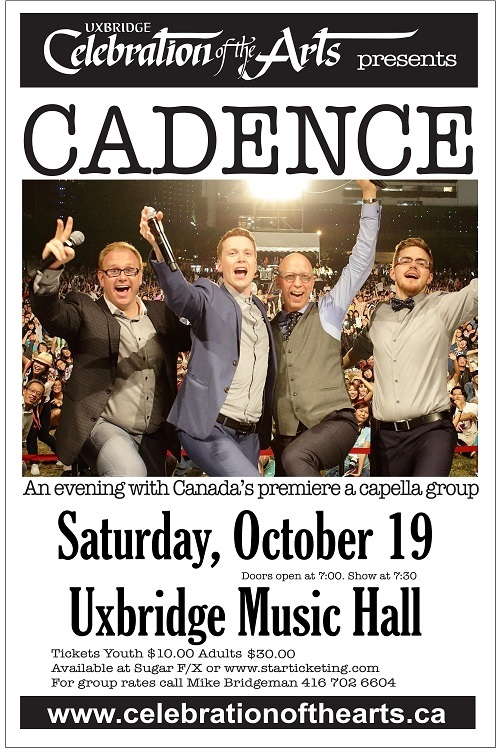 This is Cadence, Canada’s three-time JUNO Award nominated vocal group! Based in Toronto, this a cappella ensemble has been wowing audiences across the country and around the world for nearly 20 years. Whether performing at sold-out jazz clubs and concert halls, at music festivals, or for educational outreach, the members of Cadence bring an infectious energy and uncanny verve to every song they sing. Their newest album, Home has been nominated for 2 Contemporary A Cappella Recording Awards! Best Jazz Album - Home, Best Jazz Song - Mushaboom. Cadence’s live shows are always a hit. They feature a hypnotic blend of complex harmonies, intricate arrangements, vocal dexterity, and just plain fun. On-stage antics and audience participation are par for the course at any Cadence show, but so too is a mesmerizing display of musical genius. What these boys can do with their voices needs to be heard to be believed. Tickets are: $30.00 for adults and $10.00 for students. All tickets include taxes, ticket fees and Music Hall Improvement Fund.